To most people in the medical community, Meniere’s disease is a mysterious condition—I say mysterious because although it has been known for more than 150 years, doctors still don’t know what Meniere’s disease really is. You see, unlike a typical disease where doctors can define it and test to see if you have it or not, Meniere’s disease is not a disease as such. Rather, it is a collection of symptoms. Thus, it should more correctly be called Meniere’s syndrome. Since doctors can’t “find” Meniere’s disease—they can’t put their finger on it and say, “here’s your problem”—they diagnose Meniere’s disease by the process of elimination. In other words, they rule out everything else that “looks” somewhat like Meniere’s disease. After they have done this, they diagnose whatever remains as Meniere’s disease. Thus, Meniere’s disease is what doctors call an idiopathic disease from idiopathic causes. “Idiopathic” is just a fancy medical term that means “unknown”. In short, doctors are saying they don’t know what Meniere’s disease is, don’t know what causes it, and consequently, don’t know how to effectively treat it. That’s a pretty bleak picture isn’t it. It’s even bleaker if you suffer from Meniere’s disease. Then you know just how horrible an experience these attacks can be. If you don’t know what Meniere’s disease is like, here’s the 30-second “elevator” version. Meniere’s disease typically comes as a series of “attacks”. A classic Meniere’s attack includes a fluctuating hearing loss, vertigo (often accompanied by nausea and vomiting), tinnitus and a feeling of fullness in your affected ear. An attack can last from a few minutes to a few hours to a few days. For many people with Meniere’s disease, vertigo is the worst symptom. Here’s three real-life examples to help you understand the severe trauma such people can suffer through. I used to have terrible vertigo attacks. The room would spin in one direction constantly for a week or two, then in the opposite direction for ‘daze’ on end. Then it would stop for a week, or for several months, and then start again. To Muriel, Meniere’s disease is a dreaded, disabling affliction. Depending on the severity of her attacks, she experiences mild to violent dizziness/vertigo. During light attacks she may be able to manage on unsteady legs—bumping into door jambs or furniture—trying to carry out necessary chores around the house. Severe attacks are another story. At such times she has no sense of balance whatsoever. She can’t walk or otherwise move around. Her overwhelming sensation is the horrendous spinning of the world around her and the attending nausea. A drop attack is when you are literally thrown to the ground quite violently with a severe case of spinning vertigo. I’ve blacked out from the force of hitting my head either on the way down or when I hit the ground. You cannot get your hands out in time and that’s the scariest part of it. I’ve hit my head many times and opened it up a few times. Now for some good news. Although medical doctors and medical science may not know much about Meniere’s disease, and apparently have mostly been “barking up the wrong tree” all these years, that’s not to say that no one knows anything about the basic causes of, and effective treatment for, Meniere’s disease. Surprisingly, one of the most common factors that results in Meniere’s disease is quite simple to ascertain. Even better, the treatment can be fast, simple and painless. What’s amazing is that it has taken all these years for someone to figure this out. Furthermore, the solution was serendipitous. It did not come about through a lot of scientific research. Here’s the story. 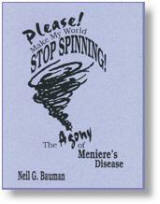 I suffered from Meniere’s syndrome, or loss of balance, spinning and dizziness for forty-five years! I had all the things that went along with it: nausea, ringing in my ears, falling with the resulting broken bones and pain. It’s a force that could really throw me to the floor at times. I could not look up or down, or lie flat, without the spinning starting immediately. So, to avoid falling, I learned to walk around by walls, and to keep my head steady or level and to hang onto everything. Michigan University Hospital in Ann Arbor, Wesley Memorial Hospital in Chicago and many neurosurgeons in Michigan, Illinois and Florida could do nothing to help me—only medication, which would make me sleep. This and similar success stories from other patients got Dr. Burcon thinking. He began carefully documenting any cases of people with Meniere’s disease that came to him. He soon realized that there was one thing in common that all the people with Meniere’s disease that came to him had—and that was evidence of neck trauma—specifically, whiplash. Once he understood the cause, his chiropractic training suggested the treatment needed to correct this horrible condition. To date he has successfully treated more than 530 consecutive cases of people with Meniere’s disease. That is not just an impressive success rate, it’s a phenomenal success story, and one you need to know about if you have Meniere’s disease and nothing else is working for you! There are a number of physical factors that seem to underlie Meniere’s disease. Here are some prominent ones. Your second vertebra (C2) is called the “axis”. This is the vertebra that allows you to turn your head left and right. You could call it the “no” bone because it allows your head to rotate left and right as you shake your head “no”. As we have just seen, this head-neck misalignment results in pressure on the brainstem. This can cause interference at the point where your head and neck join (the atlas). “If the atlas is out of its proper position, it can irritate, constrict or disrupt vital nerve signals to any portion of your body. This can cause muscle or joint pain, organ dysfunction, lowered immune system and countless other conditions that you would not ordinarily relate to a problem originating in your neck” (6) including the symptoms of Meniere’s disease. Therefore, it is important for your health to keep your head “screwed on straight”. This is where upper cervical chiropractic treatment comes in. Adjusting the atlas (and axis) can take this pressure off your brainstem, thus alleviating many problems by allowing your brain to send its healing messages throughout your body and allowing your spine to revert to its proper alignment. Meniere’s disease is also called “endolymphatic hydrops”. Endolymphatic hydrops, according to the Merck Manual, is defined as, “The accumulation of the fluid of the membranous labyrinth of the ear, thought to be caused by the over production or under absorption of that fluid”. Your inner ear consists of two fluids, endolymph and perilymph (Think of a balloon filled with endolymph inside a larger balloon filled with perilymph.) Hydrops is just the fancy medical name for excess fluid. Thus endolymphatic hydrops really is just an excess of endolymph. When everything is working correctly, your body continually produces new endolymph, and at the same time—since your inner ear is a closed system—absorbs an equal amount of the existing endolymph, thus maintaining a constant endolymphatic pressure. Doctors keep coming back to the idea that Meniere’s disease is somehow associated with the build-up of excessive endolymph (endolymphatic fluid) in the balance (vestibular) portion of the inner ear. This only happens if something upsets this delicate system so that your body produces too much endolymph or cannot absorb the existing endolymph fast enough. When something impairs your body’s ability to properly regulate the amount of endolymph in your inner ears, such as pressure on your vestibulo-cochlear nerve from a subluxation of the atlas, you can end up with Meniere’s disease. Thus the real problem underlying Meniere’s disease isn’t found in your inner ear, but is caused by having your atlas/axis vertebrae out of proper alignment. Whiplash can knock you “off your rocker”. Dr. Burcon has positively established a link between both Meniere’s disease (and trigeminal neuralgia) with whiplash injuries that misalign the base of your skull with the top of your neck. This creates a lesion affecting your Eustachian tubes and/or the trigeminal ganglion. Whiplash injuries set the stage, and then other conditions may eventually follow. In layman’s terms, basically whiplash is when the vertebrae in your neck are “out” such that your head gets stuck tipped forward and off to one side. This irritates the nerves in your autonomic nervous system so they don’t work properly. In addition, blood flow is reduced in the cervical area. So is the flow of cerebral-spinal fluid (CFS). This is important since, as we previously noted, Meniere’s disease is thought to be related to problems with excess endolymph (CSF) in your inner ear. Furthermore, since the 5th cranial nerve (trigeminal nerve) is compressed, it affects your soft palate so it quits working right, thus affecting proper Eustachian tube function. In turn, this causes the feelings of fullness in your middle ear on the side affected by Meniere’s disease. The 5th cranial nerve also controls the proper functioning of your temporo-mandibular joint (TMJ) which also can affect Eustachian tube function. Finally, when the 8th cranial nerve (the vestibulo-cochlear nerve) is affected, it can result in low-frequency hearing loss, tinnitus and balance conditions such as vertigo and dizziness. (8) Who would have guessed that a single neck bone could cause all these problems and result in what we call Meniere’s disease? Chiropractors talk about subluxations. I just say my back or neck is “out”. In medical terms a “luxation” is a complete dislocation of two bones. In contrast, a subluxation is an incomplete luxation (slight dislocation). Thus, a subluxation occurs when the alignment between two bones is altered, yet at the same time, the two joint surfaces remain in contact with each other (Stedman’s Medical Dictionary). It is interesting that Meniere’s disease generally occurs in only one ear at a time. Furthermore, which ear it occurs in is determined to a large extent by the direction of the subluxation. The following table is based on the results Dr. Burcon obtained from examining 300 Meniere’s patients. Note: Many more people suffer whiplash and other cervical trauma than have Meniere’s disease. One reason everyone doesn’t end up with Meniere’s disease from an atlas/axis subluxation is because they didn’t get the specific subluxation that Dr. Burcon has found to result in Meniere’s disease (bottom line in the above table). Other subluxations don’t seem to cause Meniere’s disease (or at least not very often), but they can certainly cause a number of other problems in your body. (See the next section.) Therefore, it is a good idea to have your atlas/axis checked by a upper cervical chiropractor after any occurrences of whiplash or other head/neck trauma if you desire to remain in good health. Incidentally, the C1 and C2 vertebrae are intimately related. As a result, if one goes out, the other is also probably out too. They both usually move in the same direction. (5) However, they are not necessarily “out” by the same amount. Dr. Burcon further explains, “When the atlas is the major subluxation, vertigo with vomiting is the major symptom. However, when the axis is the major subluxation, hearing loss, ear fullness and tinnitus are the major symptoms.” (9) This is why if only one vertebra is “off”, you may have incomplete Meniere’s disease—what doctors sometimes call vestibular hydrops (in the case of an atlas subluxation) and cochlear hydrops (in the case of an axis subluxation). Because the atlas and axis vertebrae are the gateway to the rest of your body, when either or both of these vertebrae are “off”, it prevents the nerves from working properly and transmitting healing messages to the rest of your body. The result is that a number of what seem to be unrelated problems can develop. For example, about 50% of the people with Meniere’s disease get migraine headaches. As you can see from the list below, migraine headaches can be caused by an atlas subluxation, so this makes sense. Obviously, all the above conditions can have more than one cause, but as Dr. Burcon says, “I always keep going back and back in a person’s case history and I start to see these progressions over time—one thing after another that are seemingly unrelated,” (5) yet most of these conditions are the ultimate result of the upper cervical spine being out of alignment. The good news is that by adjusting the atlas and axis (and any other vertebrae) that need adjusting, upper cervical chiropractors can generally alleviate, and often eliminate, the above conditions. This is also probably why few people are diagnosed with Meniere’s disease at a younger age. Remember, this 15-year delay is the average delay. Some people have their Meniere’s symptoms appear much sooner (and obviously this is what happens when children and young adults get Meniere’s disease), and some have a greater delay than 15 years. In any event, people typically are diagnosed with Meniere’s disease in middle age—around age 40 or so—yet their injuries most often happened 15 to 25 years previously during their high school or college years. For example, they may have been in a car accident when they were learning to drive or soon after—during their reckless driving years. They may have had one or more sports injuries in high school or college. They may have done some dumb stunts in their youth or in college that resulted in “falling on their heads”. Furthermore, few people list these old injuries on their doctor’s admission paperwork. In fact, they have often long-since forgotten about them. Thus, they fail to make any connection with these old injuries and their current Meniere’s disease symptoms. For example, you may be big-boned or small boned. That is a genetic trait you inherited from your parents. You may wonder what this has to do with Meniere’s disease. If you have big bones, you will have larger vertebrae and larger holes in the center for the spinal nerves to pass through. If you have smaller bones, your vertebrae likely will have smaller holes in their centers. You may also have larger or smaller nerves (another genetic trait). If you have large bones and small nerves, obviously your atlas could have a subluxation to some degree and still not “pinch” your nerves. In contrast, if you have small bones and larger nerves, even just a tiny subluxation could put pressure your nerves and lower brainstem and result in things such as Meniere’s disease. Some people have big bones and little nerves. Thus, most of their problems are going to be structural. Some people have bigger nerves and smaller bones and they are going to have all kinds of neurological and functional complications with that structure. Furthermore, some people have a combination of both and their problems will go in both directions. This is just one example of how genetics can play a role in whether you experience Meniere’s disease or not. Furthermore, Meniere’s disease involves the 8th cranial nerve (the vestibulo-cochlear nerve that controls both the hearing and balance systems). When this nerve is compressed, it can result in an inner-ear symptom complex consisting of attacks of vertigo, low-frequency hearing loss, and tinnitus. Also, “stellate ganglion blocks [injecting a local anesthetic to temporarily numb the sympathetic nerves] can be beneficial in controlling Meniere’s disease symptoms, highlighting the influence of the autonomic nervous system.” (9) The stellate ganglion are a collection of sympathetic nerves located on each side of your voice box at the level of the sixth and seventh cervical vertebrae (the last vertebra in your neck). As you can see, there are many factors that can be involved in Meniere’s disease, but it always seems to come back to the underlying fact that the atlas and/or axis vertebrae are out of proper alignment. Reduction in vertigo for Meniere’s patients are similarly impressive. Before treatment, on a scale of 0 to 10 with 0 being no vertigo and 10 being the worst vertigo imaginable, these 470 patients rated their vertigo (both frequency and intensity combined) at an average of about 7.8. Six weeks after initial treatment they again rated their vertigo, but now their frequency/intensity rating dramatically fell to just 2.8 (a 64% reduction) That alone would make most Meniere’s sufferers ecstatic! But that’s not all. At one year post treatment, vertigo frequency/intensity ratings dropped to about 1.8, and by the end of two years post treatment, these ratings were down to 1.2. Even more impressive, by the end of 3 years these ratings dropped to less than 0.1! In other words, by the end of 3 years, you essentially do not have problems with vertigo anymore! (9) That is wonderful news! The answer is “yes, all chiropractors are trained in spinal adjustments, but their training does not prepare them to be experts in specifically adjusting the atlas and axis vertebrae! Regular chiropractors are people who have attended a recognized chiropractic school and received their Doctor of Chiropractic degree (DC). To obtain this degree they must first earn a 4-year bachelor level degree followed by a 4-year doctoral degree in chiropractic. All upper cervical chiropractors have earned DC degrees, but they have also gone on to take a 1-year post-doctoral specialty in upper cervical spine treatment techniques and associated clinical training. Only about 2% of chiropractors go on to take the upper cervical post-doctoral training, but even so, there are upper cervical chiropractors scattered around the country. There are a number of different approaches to upper cervical chiropractic adjustments—about 10 or so. All of them require extra training. Furthermore, all of them require extra time with each patient. Dr. Burcon is partial to the “hands-on” Blair method, but he is quick to point out that the other methods are all good too. In addition to the Blair method for treating the upper cervical spine, some of other methods include the Atlas Orthogonal, the HIO (Hole-in-One) Toggle Recoil, the Kale Brainstem, the NUCCA, the Knee Chest, the Orthospinology/Grostic, the Quantum Spinal Mechanics and the Palmer Specific to name some of the more common ones. You can learn more about these various upper cervical treatment methods at http://www.upcspine.com/tech.htm. Each of these methods have their unique advantages in certain situations. As Dr. Burcon explains, “There is no one chiropractic technique that works best for every patient, every time.” (9) For any given patient, one method may be better than the others for some reason. (5) Since everyone is made slightly differently, each person may need one or another of the various treatment methods. If you are worried about chiropractors being too rough and jerking you around and cracking you up, you’ll be in for a pleasant surprise. You see, upper cervical chiropractors do not “manipulate” your neck; they “adjust” it. This adjustment technique is quite tolerable, non-invasive and involves no twisting or cracking of your neck. Cutting through the noise about manipulation, it’s important to understand that there is a ‘huge’ difference between ‘manipulation’ and ‘adjustment’. True upper cervical spine chiropractors don’t just grab your head and twist your neck ‘hoping’ to unlock, some ‘locked’ vertebrae. Nor do they crack, crunch, rotate, or take your neck to its full range of motion and move it with high velocity in the other direction. This type of approach is what I would call manipulation. When choosing an upper cervical chiropractor, you want to make sure that your chiropractor uses specific measuring techniques so he knows what is “out”, and which way it is “out”. After treatment, you want to be sure your chiropractor has ways of knowing that the atlas and axis are now in proper alignment. One technique many chiropractors use is to have you lay on your stomach. They then compare your leg lengths. (Typically they check that the back of the heels on your shoes match exactly.) If any vertebrae are “out”, typically your spine shifts, which tilts your pelvis, resulting in one leg appearing shorter than the other. They then adjust your spine so it is in proper alignment. When they do this, your pelvis returns to level, and thus both of your legs now appear the same length. I use X-rays. I always take X-rays before, but not always after, especially if a patient doesn’t want many X-rays taken. As for post-treatment X-rays, sometimes the insurance company wants one, sometimes the patient wants one, sometimes I need one for my research, but I don’t do a whole lot of post-treatment X-rays. If you are doing well, I probably wouldn’t take another X-ray for a year if we were getting the results that we were looking for and I didn’t need more information or confirmation. If you just go by feel (challenges) you will be right about 85% of the time, but that is not good enough for me. That is why I take X-rays. B. J. Palmer, who started the specific cervical treatments, said you couldn’t be specific without an X-ray. He was one of the first chiropractors to buy an X-ray machine. The second method I use is thermography. Thermography is only measuring the heat you are giving off. Thus, there is no X-ray radiation to worry about. As a result, you can take as many thermographs as you want without any danger to the patient. Most Blair chiropractors use thermography as their second way to check their adjustments. After you have had an upper cervical chiropractic treatment you need to be very careful not to put your neck “out” again. Thus, an important part of the treatment is to lay down and rest for 20 minutes or so right there in the chiropractors office, after which, a good chiropractor will recheck your neck to be sure it is still in proper alignment. Some good upper cervical chiropractors tell those patients who drive to their appointments to back their cars into a parking stall so they can drive out without turning their necks too far like they would have to if they were backing out of a parking spot. Doing this helps you prevent your atlas and axis from going “out” again before you even get home. It takes time for your ligaments, tendons and muscles to shrink and hold the proper alignment again. Thus you may have to have several adjustments in short order to keep them in place while they heal. Thus the question arises, “How often do I have to have an upper cervical chiropractic treatment?” The answer is that it depends on your own body. You see, your vertebrae may not stay in place after the initial treatment because, by the time you sought treatment, your ligaments, tendons and muscles had all been stretched out of shape for a number of years, and it takes time for them to shrink and get used to holding your vertebrae in their proper positions again. This is why initially “some people have to be corrected once or twice a week, or even more often, then one or twice a month. Other people can hold their correction for several months, even a year at a time. Everyone is different. After upper cervical treatment, your Meniere’s and other symptoms may decrease immediately, or pain may change and move to another area of your body. This is a good sign that your body is now busy healing itself. Will Upper Cervical Spine Treatment Help You? The short answer is you won’t know for sure until you have tried this treatment. However, here are some common ear and related conditions that may indicate your atlas is “off”, and thus you could benefit from upper cervical chiropractic treatments. Do you have ear symptoms such as tinnitus, watery sounds in your ear, your ears feel blocked, or you have Meniere’s Disease, otalgia (ear pain), or recurrent ear infections? Do you often get headaches or migraines? Can you remember any trauma (even minor) to your head, neck or shoulders? Do you experience any balance problems such as dizziness, vertigo or movement sensations when nothing is moving? By now you probably are eager to find an upper cervical chiropractor and see what they can do to help you bring your Meniere’s disease under control. Fortunately, upper cervical chiropractors are easy to find if you know where to look. Greg Buchanan’s website gives a wealth of information on upper cervical chiropractic. Furthermore, he maintains a list of upper cervical chiropractors scattered all over the world so you (hopefully) can find one near you. Just go to the above link and click on the fifth button across the top “Practitioners”. From the drop-down menu choose your area of the world. If you live in the USA or Canada, choose North America, then click on the “View” button (on the right) for your state (or province) and you will see an alphabetic listing (by chiropractor’s last names—not business names) of the upper cervical chiropractors in that state/province. Each listing gives not only all the contact information you need, but also what method of upper cervical techniques they use, what instruments they use, whether they take X-rays or not, etc. You can also go to the main web page for each of the various upper cervical chiropractic associations (each organization is associated with one specific method) and look at the listing of chiropractors trained in their method. These listings may be more complete and up-to-date than those on Buchanan’s website. To find an upper cervical chiropractor that practices a specific method (such as the Blair method), go to Buchanan’s web page that lists these various methods and click on the name of the method you want to investigate (in the column on the left) or on the “Read More” link at the bottom of the paragraph describing the method on the main part of the page. Usually there is a listing of chiropractors using that method somewhere on that website. A good number of years of experience (a minimum of 15 or 20 years). This is because it takes years of practicing to become an expert upper cervical chiropractor, especially in treating a complex condition such as Meniere’s disease. A chiropractor that uses the Blair method (if you can find one reasonably near you). A chiropractor that has a proven track record in successfully treating people with Meniere’s disease. A chiropractor that uses at least two methods to tell if you are in adjustment (X-rays and thermography, for example). A chiropractor that takes X-rays so he won’t miss tiny subluxations. If you want to start with the most experienced upper cervical chiropractor for Meniere’s disease and other difficult neurological cases, you can’t go wrong by contacting Dr. Burcon’s clinic. He has a spectacular 97% success rate for people with Meniere’s disease and trigeminal neuralgia. (11) He treats people from all over the world (and also sometimes collaborates with an upper cervical chiropractor near you if you need extended treatment). Dr. Burcon’s contact information is on his website. Select “Contact” (on the left). Also, check out the “Burcon Chiropractic Research Institute” website for further information about him. Last, but certainly not least, don’t forget to investigate each chiropractor before you commit to him/her (some chiropractors are better than others, some have more training than others, some have more experience with Meniere’s than others, some have better testing protocols than other, etc.). You alone are responsible for your own health, so do your own “due diligence”, then decide whether you want to proceed, and if you choose to proceed, to whom you want to go. For those who choose to seek upper cervical treatment, please comment here on your experiences whether good or bad. This will help other Meniere’s sufferers decide whether, and from whom, they want to seek upper cervical chiropractic treatment. I wish you well in getting your head “screwed on straight” and finally kissing good-bye to your Meniere’s (and other) symptoms that have plagued you for so long. More good news. If you have Meniere’s disease and and want/need support and friendship from other people who also have Meniere’s disease, join what is probably the most wonderful on-line support group for people with Meniere’s disease—the Meniere’s list in the SayWhatClub (SWC). You can join the SayWhatClub by going to http://www.saywhatclub.com/ where you can learn a bit about the SWC and fill out a membership application. Someone from the hospitality committee will then contact you and introduce you to the Meniere’s list. You will be welcome. I look forward to meeting you there. (2) Heselsweet, Geraldine, 1999. Success Story. (4) Blair Upper Cervical—Dr. William G. Blair. (5) Burcon, Michael. 2015. Personal communication. (6) FAQ. Upper Cervical Chiropractic. (7) Buchanan, Greg. My Findings. (8) Burcon, Michael. Upper Cervical Protocol & Results for 300 Meniere’s Patients. Sixth International Symposium on Meniere’s Disease. Kyoto, Japan. (9) Burcon, Michael. Cervical Specific Protocol & Results for 300 Meniere’s Patients. Presented at the New Zealand College of Chiropractic, Upper Cervical Conference. (10) Burcon, Michael. Upper Cervical protocol for Thirty Meniere’s Patients. (12) Buchanan, Greg. Introduction to Upper Cervical Techniques. Years ago, about the time the dinosaurs stopped roaming the earth, I had a cell phone that worked wonderfully well for me. It’s secret was a special integrated amplifier called the “Chaamp” that provided me with more than enough amplification in spite of my severe hearing loss. I loved that cell phone/Chaamp combination and used it for a number of years. Although it outlived the dinosaurs, I knew its days were numbered as advancing technology was quickly making it obsolete. Thus, I began looking around for a replacement. A Bluetooth headset was obviously the way to go—one that would work with all Bluetooth-equipped cell phones—no matter how fast technology kept changing. Unfortunately for me, there were two major problems. First, the Bluetooth headsets available did not work with hearing aids (they were not t-coil compatible), and second, they did not work without hearing aids either, as none of them had enough volume for me. With nothing suitable available, I approached Serene Innovations about my need for such a device—a device that would work with any Bluetooth-equipped cell phone, and that would have the volume I needed when I was not wearing my hearing aids. Fortunately, Serene Innovations was interested and we worked together for a couple of years to design such a gizmo. I drew up the specifications—a wish list of what I, as a hard of hearing person, wanted and needed in a Bluetooth cell phone amplifier. Eventually, that all came together and the “HearAll” was born. While it was in final testing, Verizon suddenly quit supporting my dinosaur cell phone and instantly I was left without a means of hearing on a cell phone. I purchased a new smart phone—an iPhone 5s as it happened—but as I knew, it didn’t have enough volume for me. You can imagine how eagerly I was awaiting the imminent release of the new HearAll Model SA-40 cell phone amplifier that came out a couple of months later. Not only does the HearAll help me hear on my cell phone, it also has a number of cool features just perfect for hard of hearing people. The HearAll is just like its name says, you can hear all. 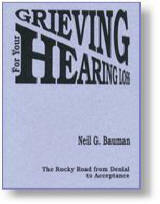 It is wonderfully versatile, whether you are wearing hearing aids, or just have your “broken” ears to hear with. As a result, if you forget your hearing aids, they break, or you run out of batteries at an importune time, you can still use your cell phone if you have the HearAll with you. The HearAll is designed, not only for hard of hearing people, but also for hearing people who have to hear under difficult listening conditions. For example, when there is a lot of background noise around, you simply crank up the volume until you can hear over the noise. At the same time, the soft flexible earphone “cup”, when pressed against your ear does a good job of helping keep all the extraneous racket out, again helping you hear better. Furthermore, if you’re like me and need more volume, you typically hold any phone tightly against your ear and the soft flexible “cup” doesn’t hurt your ear like hard plastic tends to do, especially on longer calls. The HearAll has three different operating modes—handset mode, speakerphone mode and t-coil mode. In handset mode, you just hold it up to your ear like you’d do with any cell phone. With the convenient volume control buttons, you can quickly set the volume to whatever level you need. Note: the HearAll should have all the volume you need. Unlike most Bluetooth devices, the HearAll provides up to 40 dB of amplification so you’ll be able to hear on your cell phone without straining. In speakerphone mode you (and those with you) can listen to the caller with both ears—whether you have hearing aids with t-coils or not. Again, the convenient volume control lets you set the volume at the level you need (within reason). Finally, in t-coil mode, it’s powerful t-coil couples with the t-coils in your hearing aids to let you hear beautiful, clear sound without all the extraneous racket around you affecting your hearing. Furthermore, because your cell phone is not up by your hearing aids, you never get any interference from your cell phone like you might if your cell phone didn’t have a high enough( M4/T4) interference rating. Thus, when using the HearAll you can use it with any cell phone no matter what the M and T ratings are. How cool is that? Another cool feature is that when in t-coil mode the speaker is turned off so no one can ever overhear your conversations. Since we hard of hearing people so often have to have a lot of volume in order to hear, any hearing people around us can easily overhear our private conversations. With the HearAll in t-coil mode, your conversations are totally private since you are hearing solely via your t-coil—no sound comes out of the speaker. Note: in handset mode, just by pressing the earphone cup tightly against your ear, you can also prevent sound escaping so those nearby can’t overhear your conversation as much as before. 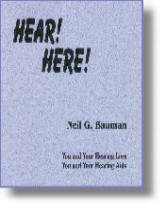 Note: hearing with both ears has two decided benefits. First, you can understand speech better than when just hearing with one ear. Thus you don’t have to strain as much, or ask for as many repeats. Second, you can hear better with less volume than you need when listening with one ear. For me, this makes all the difference between whether I get headaches when using a phone or not. And talking about understanding speech better, the HearAll has a three-position tone control (located on the left side) so you can set it to where you understand speech the best. You can set it to have high-frequency emphasis, mid-range emphasis or low-frequency emphasis depending what sound frequencies you want to boost in order to understand speech better. Set it to whatever works best for you. Another neat feature is that the HearAll has a mute button. If you want to say something to a nearby person and don’t want the person on the other end of the phone to hear you, simply press the mute button. The mute light will turn green and the person on the other end will be “locked out”. Press the mute button again to turn off the mute function and the green light will go out and you’ll be back in normal talk mode again. The HearAll works with virtually all cell phones that have Bluetooth capabilities built in—whether they are “smart” phones or “stupid” phones. Since most phones have Bluetooth built into them, it is unlikely that you’ll have to go out and get a new phone. And when you do get a new phone in the future, as long as it has Bluetooth built in, it will also work with your HearAll. In order to use the HearAll with your cell phone, you first need to pair your phone with the HearAll (exactly like you have to pair any other Bluetooth device before you can use it). Pairing is easy. First, turn on the Bluetooth feature on your cell phone. Next, turn on the HearAll. In a few seconds the ON/STBY and BATT lights will begin alternately flashing green and orange indicating the HearAll is searching for any Bluetooth devices in range. On the screen of your cell phone you should see under Bluetooth devices a new device listed—the model number of the HearAll, namely “SA-40″. Click on the SA-40 on your cell phone and the two devices will now pair. When completed, your phone should say “Connected” beside the SA-40. At the same time, the alternating flashing lights on the HearAll will stop. You are now paired. You don’t have to pair the HearAll again unless you deliberately delete this Bluetooth connection on your cell phone. Now, whenever your cell phone and HearAll are in range of each other (assuming you have the Bluetooth function activated on your cell phone) your HearAll will automatically pair to your cell phone. The proof of this is that the ON/STBY light will flash green every 6 seconds. The designed range of Bluetooth devices is 33 feet (10 meters) although many Bluetooth devices I’ve tried wouldn’t work more than 10 or 20 feet away from the paired device. I was pleased to see that the HearAll works well all the way out to the 33 foot designed range. The HearAll is a wireless Bluetooth device. Thus, you can leave your cell phone on your desk or counter, for example, and be up to 33 feet away from it and still get a strong signal assuming you have an unobstructed line of sight. This distance may be less in buildings with metal in the walls when you do not have an unobstructed line of sight to where your cell phone is. To answer an incoming call on the HearAll, just press the talk button (the one with the phone handset icon on it) and the ON/STBY light will change from flashing green every 6 seconds to steady green while the call is in progress. To hang up, press the talk button again and the ON/STBY light will resuming flashing every 6 seconds. The HearAll is also designed for use in your car as a hands-free phone. It comes with a magnetic visor clip that you slide over the front edge of your sun visor. The HearAll magnetically attaches to the clip. Now you can use it in hands-free (speakerphone) mode if you wear hearing aids or only have a mild to moderate hearing loss and don’t wear hearing aids. I found that for my severe hearing loss, if I’m not wearing my hearing aids, I can’t quite hear/understand the person talking that way. Not an insurmountable problem. All I did was plug in a pair of earbuds and I could hear very well while driving and still be “hands-free”. The HearAll uses a rechargeable lithium-ion battery pack so you won’t have to keep replacing dead batteries. When the battery charge is getting low, the orange BATT indicator light will flash continuously to warn you. Recharging the HearAll is simple—just plug the recharging cable into the micro USB port on the lower left side of the HearAll and plug the other end into a A/C wall receptacle. In just 3 or 4 hours it’s battery will be up to full charge, ready to go. While charging, the orange BATT indicator light will stay on. When the battery is fully charged, the BATT indicator light goes out. Should you ever need to, you can use your HearAll while it is charging. Just plug the charger in and continue using it. If the battery dies while you are out driving (perhaps you are on a long trip), you can charge it in your car if you have a little power inverter that plugs into the cigarette lighter (I always have one in my car) and you have your recharger in the car with you. However, with its high-capacity battery, its unlikely you’ll need to recharge the HearAll in the car as long as you recharge it every night or two. Standby time for the HearAll is up to 14 days depending on the condition of the battery. (New batteries have more capacity than older batteries. Older batteries slowly lose their capacity as they age.) Talk time is up to 10 hours, again depending on the battery condition. The HearAll works with Bluetooth cell phones, but it also works with other Bluetooth devices as well. For example, you can use it with your iPad or iPod. Experiment and see what other uses you can find for this wonderful, versatile HearAll. If you’re now drooling at the thought of using a cell phone like everybody else, here’s how you can get one for yourself—and it won’t cost you an arm and a leg either! Although the regular price of the HearAll is $99.95, you can get it for only $83.63 from the HearAll page on the Center’s website. Once you have tried it, I’ll bet you’ll love your HearAll as much as I do mine! The bat “ear trumpets” are made out of naturally-furled leaves. These furled leaves let the bats better hear other bats in their group flying above them from a greater distance than would otherwise be possible. This helps keep the group members from getting separated. This is where the furled leaves come into play. The “ear trumpet” shape of the leaves amplifies the incoming calls up to 10 dB. (1) (We would perceive this as double the volume.) This makes a big difference in how well roosting bats could hear their flying friends. You can see some fascinating pictures of these bats roosting in the bottoms of their “ear trumpet” leaves. (1) Pappas, Stephanie. 2013. Speak Up! Costa Rican Bats Use Leaves as Hearing Aids. (2) Bats in Costa Rica Using Leaves for Hearing. 2013. Audiology Worldnews. There is a lot of ongoing tinnitus research. Some of the findings are not new, but reinforce what we already knew about tinnitus. If you want to learn more about tinnitus, the many things that can trigger tinnitus, or more about a number of things you can do to help bring your tinnitus under control, check out my book, When Your Ears Ring—Cope with Your Tinnitus—Here’s How. (1) Thong, J. F., et. al. Dec. 2013. Habituation Following Tinnitus Retraining Therapy in Tinnitus Sufferers. Annals, Academy of Medicine, Singapore. Summarized in Tinnitus Today, Spring, 2014, p. 19. (2) Rabau, S., et. al. Jan. 2014. Changes Over Time of Psychoacoustic Outcome Measurements Are Not a Substitute for Subjective Outcome Measurements in Acute Tinnitus. European Archives of Oto-Rhino-Laryngology. Summarized in Tinnitus Today, Spring, 2014, p. 19. (3) Gibrin, P. C., et. al. Dec. 2013. Prevalence of Tinnitus Complaints and Probable Association with Hearing Loss, Diabetes Mellitus and Hypertension in Elderly. CoDAS. Summarized in Tinnitus Today, Spring, 2014, p. 19. As many of you know, I am not a fan of taking prescription drugs, especially when there are safer alternatives, and almost always, there are safer alternatives. These safer alternatives will not only save your ears from the ototoxic side effects of the drugs, but they can also save your life. In this study of approximately 35,000 people who used tranquilizers, 47% used benzodiazepines and 14% used the “Z” drugs. Benzodiazepines include drugs such alprazolam (Xanax), chlordiazepoxide (Librium), clonazepam (Klonopin), clorazepate (Tranxene), diazepam (Valium), estazolam (ProSom), flurazepam (Dalmane), lorazepam (Ativan), midazolam (Versed), oxazepam (Serax), temazepam (Restoril) and triazolam (Halcion) among others. Z-drugs include zopiclone (Imovane), and its close derivative eszopiclone (Lunesta), zoleplon (Sonata) and zolpidem (Ambien). The benzodiazepines increased the risk of death 3.7 times while the “Z” drugs 3.2 times. (1) Did you get that? According to this study, taking benzodiazepines increases your risk of death 370%, not to mention all the ototoxic (and other) side effects you will have to deal with. This is a pretty serious side effect, considering that an effective alternative in dealing with your anxiety is by talking to someone about it. So there you have it. Start looking for effective, natural alternatives to drug use. Then you’ll never have to worry about the ototoxic side effects of drugs, and in the process, you may even save your life, and that is definitely worth it! If you want to look up the ototoxic side effects of the benzodiazepines or the Z-drugs if you are considering taking them, see my book Ototoxic Drugs Exposed 3rd edition. This book contains information on the ototoxicity of 877 drugs, 35 herbs and 148 chemicals. (1) New Study Shows Increased Risk of Death with Sleeping Pills and Tranquilizers. Worst Pills, Best Pills News. July, 2014, Vol. 20. No. 7. Some “kids”–I kid you not–are born with small, deformed or absent external ears. The fancy medical name for this is “microtia”. Microtia is composed of two Latin words—micro—small or tiny, and otia—from oto—ear. So literally, microtia is “tiny ears”. If there isn’t even the nub of an external ear present, the medical term is “anotia” meaning “no ear”. “Microtia is a congenital deformity affecting the outer ear (pinna) where the ear does not fully develop during the first trimester of pregnancy.” (1) In humans, microtia occurs in 1 out of every 6,000 to 12,000 births. It can affect only one ear, or both ears (1) (Fig. 1). Fig. 2. Goat with normal large ears. Doctors consider microtia a medical condition and try to repair this deformity so that children can hear properly and lead normal lives. Microtia can also occur in various animals—both wild and domesticated. 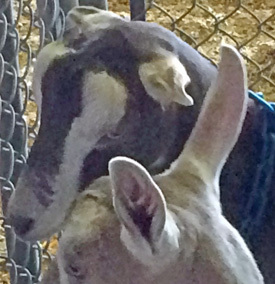 The last time I was at the Maryland State Fair, and touring the goat section in the small animal barn, I was surprised to see some goats on display that didn’t have normal ears. Since the animals on display were vying for trophies, and since microtia is considered abnormal and something to be fixed, I was flabbergasted to discover these “defective” goats on display. Fig. 3. Lamancha goat with “elf” ears. I asked the goats’ owner about their strange ears. She explained that goat breeders have actually developed a breed of goats that have microtia as one of their salient features. 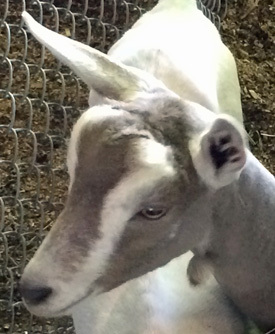 These Lamancha goats are a formally recognized breed of dairy goats. In order to be registered, they must have microtia present in both ears. There are two forms of microtia recognized for registered Lamancha goats—”elf” ears and “gopher” ears. Compared to normal goat ears (Fig. 2), “elf” ears are much shorter—perhaps an inch or two long (Fig. 3). Fig. 4. Lamancha goat with “elf” ears (back) and goat with normal ears (front). Fig. 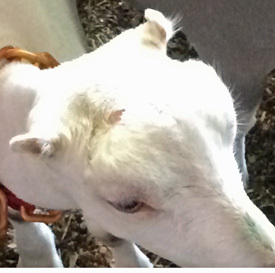 4 shows just how different these “elf” ears are compared to goats with normal external ears. Notice how abnormally small these “elf” ears are. Fig. 5. Lamancha goat with “gopher” ears. Fig. 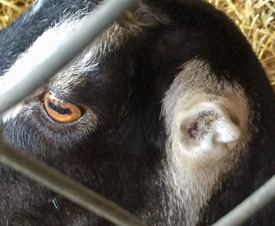 5 shows a goat that has “gopher” ears—essentially no external ears at all. Fig. 6. Close-up of a “gopher” ear. 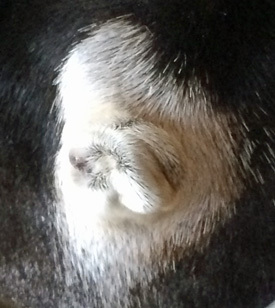 All that exists of the external pinna is a bit of cartilage covered with hair (Fig. 6). According to the owner of these Lamancha goats, these goats have normal hearing. However, I wonder. It only stands to reason that goats with normal upright pinnae will hear softer and more distant sounds better than Lamancha goats with external “elf” or “gopher” ears. Apart from Lamancha goats that are bred for their lack of normal ears, microtia in both wild and domestic animals is not common, although there are numbers of cats that have microtia in (usually) just one ear. 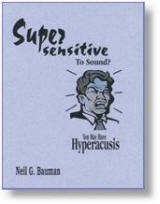 Who would have thought that hearing loss would be tied to sleep apnea? Yet that is exactly what researchers recently discovered. Sleep apnea (AP-nee-ah) is a disorder in which you have one or more pauses in breathing or shallow breaths while you sleep. Breathing pauses can last from a few seconds to minutes. They may occur 30 times or more an hour. In a study of 13,967 people with sleep apnea, 9.9% of this population had at least moderate sleep apnea. Researchers defined moderate sleep apnea as 15 or more sleep apnea events per hour. Sleep apnea events included apneas (complete cessation of airflow) and hypopneas (partial cessation of airflow). In this same population, 19.0% had high-frequency hearing loss. (Note: the researchers defined high frequency hearing loss as hearing loss greater than 25 dB at 2, 3, 4, 6 and 8 kHz. 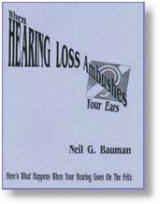 They defined low-frequency loss as hearing loss greater than 25 dB at 0.5 and 1 kHz). 8.4% of the study population had both high and low frequency hearing loss. Only 1.5% had just low-frequency hearing loss. After adjusting for a number of factors, sleep apnea was associated with a 31% increase in people with high-frequency hearing loss, a 38% increase in people with both high and low frequency hearing loss and a 90% increase in people with low-frequency hearing loss. Interestingly enough, as the number of apnea events increased (above the baseline 15 events per hour) so did the percentage of people with high-frequency hearing loss. However, there was no such correlation in those with low-frequency hearing loss. Researchers also found that hearing loss was more prevalent among people with a higher body mass index (are overweight), and those that self-reported they snored or had sleep apnea. Therefore, if you have sleep apnea, it would seem wise to seek treatment for it before it causes you (more) hearing loss. Source: Sleep apnea tied to hearing loss in large study. Donna contacted me about how to help her mother-in-law, Lois, better hear her TV. I explained about the wonders of loop systems. Then her husband Sam phoned me to ask how to best loop her bedroom. As we talked, I explained there were three ways he could hook the loop up for his mom. The first way was to loop the whole room, but since there was no easy way to hide the loop wires, he rejected that. The second way was to use a loop pad. The down side of the loop pad is you need to be directly over the loop pad in order to get the best signal. This meant Lois would need to stay in one place in the bed whenever she watched her TV. I suggested a third alternative—to loop the bed itself and have a small area carpet at the foot of the bed to hide the wires going from the bed to the TV. Sam liked this idea the best. I explained how he could plug one end of the loop wire into the back of the loop amplifier, run it around the wooden legs of the bed three times to make a 3-turn loop, and then run it back to the loop amplifier, trim it to length and plug it in—as simple as that. By looping the bed, Lois could be anywhere on the bed and still hear her TV wonderfully well. The upshot of this was they ordered the Univox DLS-50 loop amplifier and a 100′ roll of wire. A week or two later, I received an email from Donna. It speaks for itself. Here it is. At Jerry’s suggestion, my husband Sam and I contacted Neil Bauman (neil@hearinglosshelp.com ) and purchased a room loop system for my mother-in-law’s TV. This past weekend, we looped the wires around her bed as Neil suggested, attached the wires to the TV—and a miracle occurred. We turned all the volume off on the TV. Sam and I did not have to ask Lois if she could hear the television—there was such a look of wonder and joy on her face! I’m sorry we did not video it! Lois is delighted with the quality of the sound. For the first time in years, she can hear the television. She told us that she has never watched any of the shows that have caught the public imagination, like Mad Men or Downton Abbey, since she couldn’t hear the dialogue and the captions did not capture the nuances of the programs. Now she can be part of the mainstream once again. Lois spent hours that night feasting on television, but is tearing herself away in order to check out looped venues at museums, etc. So thank you Neil! The device was easy to set up and was very reasonable, in fact, priceless. If you’d like to do the same thing and hear beautiful, clear sound from your TV, all you need to do is order the DLS-50 loop amplifier and a roll of wire (black or white—your choice). The Univox DLS-50 is only $189.00 and the roll of wire is $11.99. Priority shipping is $11.40 so the grand total is $212.39 (excluding state tax if you are in PA). Not a bad price for a “priceless” device. Are Microwave Hearing Devices Slowly “Cooking” Our Kids? If you put a child with hearing aids, with an FM, and a sound field in a wireless environment, are they getting slowly “cooked”? I am not sure safety is taken into account when all of these technologies are applied layer upon layer—especially with children who have thinner skulls and developing brains. I just don’t feel confident with the information I have been given. Your thoughts are appreciated. You have posed an excellent question. Unfortunately (or fortunately depending how you see it), we live in an increasingly wireless world. Like practically every technology ever developed, there are good points and bad points to the all-pervading wireless revolution we are experiencing. The trick is to use the good while eliminating as much of the bad as possible. As so often happens, the “bad” is swept under the carpet and everyone pretends it isn’t causing any problems. That is happening with microwave wireless devices. Many/most of the wireless devices we use today operate in the microwave frequencies—typically between 1 GHz and 10 GHz or so. This means we are bathed in a microwave smog (some call it electro-smog) pretty-well every minute of every day (and all night too), and it is getting worse as more and more items we use are going wireless. Besides the microwave ovens in our kitchens, think of all the other devices at home, work and school that emit microwaves. There are Wi-Fi routers and wireless modems, cell phones, smart phones, laptop computers, tablets, wireless baby monitors, DECT (Digitally Enhanced Cordless Technology) cordless phones, wireless video game consoles, wireless burglar alarms, wireless printers, Bluetooth devices of all kinds, and numbers of other wireless electronic devices. That is not all. Outside our homes, schools and places of work there are other major sources of the electro-smog that surrounds us. These include nearby cell phone towers and all our neighbors’ electronic wireless devices and routers. For hard of hearing people the list is even longer. We use RF (radio frequency) systems integrated with our hearing aids so we can hear distant speakers and our TVs. These operate in the 2.4 GHz band (microwave frequencies). Even hearing aids can now “talk” to each other and this is also done at 2.4 GHz. All the Bluetooth assistive devices operate in this same band. And in your school, so do the wireless sound-field systems. Furthermore, there are more and more smart phone apps available to help us hear better, but to use them we need to use our cell phones (and remember, they also emit microwaves). As a result, we are bathed in even more microwaves than people with normal hearing. As scientists discovered back in the 1940s and 1950s with the development of radar and other technologies, microwaves were dangerous to human health. They are still just as dangerous today. Make no mistake about it. Surrounding ourselves in a microwave smog is not good for us. Because of the power involved, microwave radiation from cell phone towers, cell phones and Wi-Fi routers are the primary culprits, not our hearing aids and assistive listening devices that also use microwave frequencies. Note: exposure to radiation from cell towers is rapidly increasing with the deployment of 4G technology, but the average exposure from cell towers is still well below that of our cell phones themselves (1) because they are so much closer to our bodies (heads). However, for hard of hearing people, adding wireless assistive devices to the mix just compounds the problem. Furthermore, hearing aids are right against the skull—so when they “talk” to each other via 2.4 GHz, even though the power output is very low, they just add to the electro-smog assaulting our bodies. The dangers to our bodies from microwave radiation is of two kinds—thermal (heat) and non-thermal. “Cell phones radiate microwaves, as do microwave ovens. The exposure limits set by the Federal Communications Commission in the United States and by the International Commission on Non-Ionizing Radiation, Protecting for most countries in the European Union assume the only danger from microwave radiation would come from temperature increases in our brains, or from temperature increases to any other part of our bodies.” (2) In short, all the industry thinks of is thermal damage from microwaves heating up our cells and “cooking” us, They are not considering short and long term non-thermal microwave effects. To be sure, thermal effects from microwaves can be a problem if we are close to a high-powered microwave antenna. But with most microwave devices (apart from our microwave ovens which are designed to cook things), internal cell heating from microwave radiation is the least of our worries. Therefore, you shouldn’t have to worry about your child being “cooked” in school from all the microwave devices in use in the classroom. However, you do have to concern yourself with other health issues associated with microwaves from their non-thermal effects. “I used cell phones for 10+ years extensively on and off, and because of this, I developed a brain tumor. It 2007, about one week before my birthday, I was diagnosed with a 3 cm x 4 cm brain tumor. I had a stroke in late November 2006. An MRI examination revealed a brain tumor in the area of my brain next to my ear where I always held my cell phone—in the exact position where the cell phone’s antenna was located. “The first major indication that cell phones might be a health hazard came out of a massive research project funded by the Cellular Telephone Industry Association (CTIA). To the industry’s surprise and dismay, the results of the study came to the opposite conclusion from the one they were hoping for. — A nearly 300% increase in the incidence of genetic damage when human blood cells were exposed to radiation in the cellular frequency band. — A significant increase in cell phone users’ risk of brain tumors at the brain’s outer edge, on whichever side the cell phone was held most often. — A 60% greater chance of acoustic neuromas, a tumor affecting the nerve that controls hearing, among people who had used cell phones for six years or more. — “For every 100 hours of cell phone use, the risk of brain cancer increases by 5%. — For every year of cell phone use, the risk of brain cancer increases by 8%. — After 10 or more years of digital cell phone use, there is a 280% increased risk of brain cancer. “Your body is a complex communication device for cells ‘talk’, tissues ‘talk’, organs ‘talk’ and organisms ‘talk’. At each of these levels, the communication includes finely tuned bio-electrical transmitters and receivers, which are tuned like tuning into a radio station. What happens when you expose a radio antenna to a significant amount of external noise? You get static from the noise—and that is what is happening to your body in today’s electro-smog environment. Two of the more well-known biological impacts from electro-smog are the interruption of the brain wave pattern leading to behavior issues, and the interference to your body’s entire communication system, leading to abnormal neurological function such as dementia, chronic fatigue syndrome, and fibromyalgia. At the cellular level, your cell membrane receptors (the brain of the cell) recognize electromagnetic fields at very low levels of exposure producing a stress response similar to that produced by exposure to heavy metals or toxic chemicals. This can cause the cell membrane to go from an ‘active’ or permeable state where it allows nutrients in the toxins out, to an ‘inactive’ state where the cell membrane is impermeable. During a normal day, your cells will change states thousands of times, but when under constant environmental stress, the membranes can be locked in the inactive state. This is often referred to as ‘oxidative stress’ as nutrients are able to enter into the cell, while toxins (free radicals) are not allowed to leave. Furthermore, children’s brains can absorb up to three times as much radiation as compared to adults (1) since children’s brain tissue is more conductive and their smaller brains and softer brain tissue allows radiation to penetrate more effectively. You can see revealing graphics showing how deeply cell phone radiation penetrates a five-year-old child’s head (brain) as compared to the head (brain) of an adult. By comparing the first and last graph, it is obvious that cell phone radiation would penetrate in excess of 60% of a five-year-old child’s brain. In contrast, it would penetrate less than 20% of an adult brain. (8) As microwave radiation penetrates deeper into the cranial cavity, it can result in more tumors in these areas of the brain. Thus, we can expect microwave-related health problems in children much sooner than we would expect the same kinds of problems in older adults who were not exposed to microwaves for most of their lives. — “The higher the cumulative hours of wireless phone use, the higher the risk. — The higher the number of years since first wireless phone use, the higher the risk. — The higher the radiated power from the cell phone, the higher the risk. As you can see, the real risk of all the microwave devices we (and our kids) are using is not their thermal effects, but their non-thermal effects. This is what we have to guard against. The unabridged version of this article has whole sections of information on how this microwave problem is being covered up and downplayed, what other countries are doing to ameliorate this problem, and, most importantly, a comprehensive list of things you need to know and implement in your life and in the lives of your loved ones and kids in order to help reduce your/their radiation exposure from microwave devices, especially cell phones and Wi-Fi devices. Just as not everyone who smokes gets lung cancer, so not every one who uses cell phones, Wi-Fi or other microwave devices will develop brain cancer or suffer other neurological damage. Some will and some won’t. There are many variables that contribute to your susceptibility. Since you don’t know which group you will fall into, it seems wise and prudent to act now and limit, as much as is reasonably possible, given your belief system and lifestyle, your exposure to microwaves, rather than wait until bad things begin to happen in your family. I’m already doing what I can. Are you? (1) References are listed in the unabridged article. You “buried” your cell phone somewhere nearby and because of your poor hearing, you did not hear it ringing or see it blinking. And you didn’t feel it vibrating either. Result? Missed phone calls and/or missed text messages. You depended on your cell phone’s alarm to wake you up for an early flight the next day, but you slept on your “good” ear and as a result you didn’t hear your phone’s alarm vainly trying to wake you up, so you missed your flight. You wanted to be alerted whenever a phone call or text message came in, but you missed your cell phone’s “rings” because of your poor hearing and all the racket around you. As a result, you missed an important call (and now your boss is mad at you). You’re concerned about the microwave radiation from your cell phone (see article in this issue). As a result, you want to keep your phone at a “safe” distance from your body. However, you realize you probably won’t hear, see or feel it ringing from that distance. What can you do? If you relate to any of these (or similar) scenarios, you don’t have to worry anymore. Serene Innovations has done it again. They’ve come out with a cool new product that makes sure you won’t miss any more phone calls (or messages or alarms) while you sleep or are engrossed in something at your desk. The Serene Innovations RF-200 Cell Phone Ringer/Flasher is one cool device. This new gizmo is a desktop or bed-table signaling device for landline and cell phones (at the same time if you want). It will notify you when you have incoming calls by phone, Skype, FaceTime and text messages. You may find it so useful that you’ll want one for your bed-table at night (with bed shaker) and one for your desk (or wherever you spend most of your time) during the day. The RF-200 is just so easy to use. All you do is set your cell phone in vibrate mode and place it in the cradle. The RF-200 does the rest. When the ring alerter “hears” (actually “feels”) a signal, it flashes lights, sounds a loud alerting signal, and if you have the bed shaker plugged in, shakes your bed or chair. This makes it easy to know someone is calling you and is really hard to ignore. Even if you do miss a call—perhaps you were out of the room—the missed call lights stay on to alert you to that fact when you return. Just press the “reset” button on the top right corner to turn the lights off and its ready for the next call. When one of your phones rings, it is easy to tell whether you should answer your landline phone or your cell phone because of the distinctive light and sound patterns. When your cell phone rings, the two “side” lights and the two top corner lights flash consecutively in a clockwise rotating pattern. When a landline phone call comes in, the top “corner” lights on the RF-200 flash together. The ringer pattern for cell phone calls is a lower-pitched tone that warbles 3 times, then pauses, then warbles 3 times, etc. The ringer pattern for a landline call is a higher-pitched tone that warbles 5 times, pauses, warbles 5 times, etc. Another feature of the RF-200 is that it isn’t just for alerting you to phone calls. It can also alert you to text messages if you have a smart phone. How cool is that? To use the text messaging alert, plug in the short coiled cord between the base unit and the earphone jack on your smart phone. Better yet, if you have an Android or iPhone, you can program them with a special text vibration pattern so you don’t even need the short coiled cord! You just place your phone on the cradle. It’s just that easy. If you live in an area that has severe weather such as tornados, and you have Wireless Emergency Alerts (WEA) sent directly to your cell phone, the RF-200 will immediately alert you to any warnings in your area. When your cell phone receives an emergency alert, the RF-200 will immediately emit a unique ring and flash pattern. The ring sound is a high-low, high-low emergency vehicle sound that you’ll instantly recognize as an emergency “sound”. At the same time, the lights will flash in a repeated criss-cross pattern. There is no mistaking that this is an emergency alert and not a regular phone call alert! One cool undocumented feature is that you can use the RF-200 with any cell phone app you have that vibrates your phone such as count down timers, wake-up alarms, etc. This doubles the functionality of the RF-200 at no extra cost. The ring and flasher pattern for such alerts/alarms are identical to those for cell phone calls/messages. After each alert/alarm, you need to hit the RESET button to turn off the lights. Note: If you miss a cell phone call or text message (do not answer) all 4 flasher lights will stay on until you press the RESET button. This feature does not work with landline phone calls. The lights and loud alarm will get your attention if you are up, but what happens if you are in a deep sleep? Not to worry. Get the optional bed shaker. With the optional bed shaker plugged in, you’ll not sleep through any more phone calls, messages, alarms, or alerts. Just put the bed shaker under your mattress or under your pillow and you WILL wake up when it begins vibrating. If you are a “couch potato” you can slip the bed shaker module under a cushion on your sofa or lazy-boy chair—and again, you won’t miss another phone call or alert! The bed shaker vibrates in two different patterns—for incoming cell phone calls/messages it is a pattern of a long vibration followed by a very short vibration. For incoming landline calls it is a series of long vibrations. Another neat feature of the RF-200 is that it has a USB recharging port so you can recharge your phone while you work or sleep. Simply plug the recharging cord that came with your phone into the USB port. That way your cell phone will always be fully charged whenever you grab it. No more awaking to a dead cell phone (and missed calls). The ring alerter is quite loud. It sure gets my attention, even with my severe hearing loss (when it is set on “Hi”). For people with normal or near-normal hearing, there is a “Lo” setting. And if you don’t want to wake up the baby (or disturb your boss), you can set it to “Off”. You will still be alerted by the bright blue flashing lights and (optional) bed shaker. One more thing. The RF-200 is A/C powered, but gives you uninterrupted operation even if the power fails with its built-in battery backup. Just install 4 AA alkaline batteries (not included) and you’re all set. If you’re already drooling over this cool gizmo, purchase the RF-200 Cell/Phone Ringer/Flasher for yourself. For daytime use (no bed shaker) it is only $68.50. For night-time use (includes bed shaker) it is $93.45. 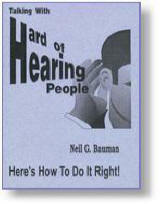 Talking With Hard of Hearing People--Here's How to Do It Right! All logos and trademarks in this site ( www.hearinglosshelp.com ) are property of their respective owner. Comments are property of their posters, all the rest © Anno Domini MMV by HearingLossHelp.com ®.